In my work in the field of agriculture I have found it useful to draw from other disciplines to help guide my work. Where I draw from often is the realm of what I call self-investigation. In short, by getting to better know myself I find I am better able to understand others and the world we live in. One of the primary tools I have used in this process is empathy. Empathy, in short, is seeing the world from another’s perspective and cultivating empathy helps us develop complementary skills such as compassion, non-judgment, and tolerance. More and more I am adopting the belief that it is primarily through empathy that we can achieve a more sustainable food system. It is through empathy we can better see agriculture through more than just the productivist lens, with its almost absolute focus on efficiency and yield, which dominates modern food production. And this was a problem – because I believed strongly in sustainable agriculture, even though I had no idea what it actually is. As you can see I set the bar for sustainability quite high, but somehow this seemed to jive with what I heard John Ralston Saul say in his CBC interview (at this point I must admit that is possible that I made up this memory, but I am pretty sure I didn’t. No, I haven’t Googled it.). So I again started looking at how people used the word sustainability, now taking into consideration my new definition. Things didn’t hold up so well. And I didn’t need to visit any farms to confirm that “This was grown in a way that could be done forever.” I’ve been to enough “sustainable” farms to know this doesn’t hold true. First and foremost because many “sustainable” farms are utilizing the waste products of “unsustainable” farms and unsustainable mining practices as inputs. There seems to be general, if often implicit, agreement on understanding sustainability in the literal sense of the word: the persistence of a system (an aim often defined as desirable but without mentioning for whom it is desirable) during a period which is generally considered as infinite. But there is no agreement on what is supposed to last. The phenomena that are worth sustaining depend on the disciplinary angle from which the problem is approached. Ecologists generally emphasise the need to sustain natural resources, or stay within the carrying capacity of an area. Many economists, however, underline the idea that the stocks of resources (natural, human, capital etc.) should be constant. But one could also argue that the quality of life should be sustained even if this implies consumption of non-renewable natural resources. Used singly, sustainability is not a satisfactory concept, and highlights the weak points of the concept of sustainable development. But, of course, my definition of sustainability is unreasonable, if only slightly, and so let’s step to the side to find the real lesson here. After this little experiment I was a bit disillusioned about what I was doing in my efforts to engage in “sustainable” farming practices. Yet, I knew I and others were making a pretty darn good effort at running sustainable farms and promoting sustainable food systems and we knew very well that productivist farms were clearly not operating in a way that “can be done forever”. In fact, the reason many of us are so adamant about promoting sustainable farming is that we feel the productivist farming model is very close to collapse; and when it collapses, so do we. Yet on we go using synthetic fertilizers, systemic pesticides, and gene-manipulated crops to continually increase the productivity of our modern farming systems. And much like the fictional Daniel Quinn character who, after jumping off the roof of a skyscraper, says to himself, about halfway down, “Well, so far so good – what’s all the fuss about?” we continue to mine the earth in a food growing base jump without thinking about how we’ll cope with the landing. But I’m not one to give up on a good idea, and so I don’t want to give up on sustainable agriculture. I used to love making compost. It was kind of “my thing”. Over several weeks in the summer I’d gather weeds from the fields and crop trimmings and fallen leaves and other detritus and pile them up next to the compost bin. Then, when it got to a certain size, I would drive over to a nieghbour’s farms to get a truckload or two of horse manure (a waste product from that farm, which was mixed with sawdust – a by-product/waste product from a nearby lumber mill) and bring it back to my farm to mix with the organic matter I had been stockpiling for weeks. This was one of my favourite activities. Making thermophilic (high-temperature) compost in a three-bin system. I’d put a water sprinkler (water is a key compost ingredient, often overlooked) over bin one of the three-bin system and turn it on, then I’d start layering in the organic matter I’d collected with the manure I had just picked up, blending them together after every few layers and making sure the materials were properly wetted from the sprinkler. I’d do this over a couple of hours until I had a compost pile that was six-feet wide, six-feet deep and about five to six feet tall. I’d top it with leaves as an insulating layer, stand back to admire my work, and then grab the compost thermometer. One of the goals of the thermophilic composting process is to generate enough heat to kill weed seeds and pathogens that may be present in the materials (another key goal is to produce the compost quickly, and at higher temperatures the decomposition process happens much faster). The general rule is if you can get the compost up to 55℃ for 3 days you can achieve this. Of course, it only gets that hot in the insulated middle of the pile, and only for a few days until it runs out of air and the microbes start dying off, so one has to eventually “turn” their compost pile to keep the heat, and decomposition activity, going at a rapid pace. The thermometer tells you how hot it gets and when the temperature starts to drop – which is the indicator it is time to turn the pile over into bin two. At this point you can add a bit more manure (and water) if you like, for it is the manure that brings in the nitrogen – the limiting nutrient needed for rapid bacterial growth which gets the pile heated up. Once the pile was turned into bin two I’d pop that thermometer back in there again, watch the temperature rise and fall and then turn that pile one more time – this time into bin three. Once the pile heated and cooled for a third time I’d let it sit and “cure” for as long as I could handle it – because, damn, after all that work I wanted to get that compost out into my growing beds. After the curing stage the total time of the process can be anywhere from 10-16 weeks. That’s when I would start digging up that pile, screening it to get a fine consistent texture (and throwing the bigger pieces back in for another round of composting or using them to mulch perennials on the farm), and getting it back into the Earth. One summer day, I had just finished applying a fresh batch of compost as a mulch on many of my growing beds. I had also used some to transplant some winter brassicas and I put some in reserve for future use. After thinking back to all the work that went into making that compost and how I was able to reintegrate all that material back into the Earth to feed my soil, I said to myself, “Surely, my farm is more sustainable because I did that.” And that is when it hit me (remember – that composting part was just a cutaway – we’re talking about defining sustainability here), sustainability isn’t a thing you achieve, it is something you work towards; it is something you strive to achieve – however impossible that may actually be. So at that point (actually, it wasn’t at exactly that point, but you probably have other things to do today so let’s move this along) I changed the language I use around sustainability and started talking about “increasing sustainability” or “decreasing sustainability” instead of just “sustainability” on its own. This made more sense to me and I felt it was more accurate as well. So for many years now I have used this idea of a spectrum of sustainability in which you can slide in either direction. Of course, sustainability is a complicated concept. For example – the process I went through to create that compost took a lot of time and effort, and the one rule about completing any task that I try to keep mind is, “while I am doing this task, I am not doing another task.” And on a farm there are many tasks to be done. So did spending that much time making compost really increase the overall sustainability of my farm? Because sustainability is about more than just the ecological aspect of farming. Along with the ecological sustainability I had started this journey on, I started thinking about what I called “personal sustainability” in very much the same way, asking “how long can I sustain farming this way?” And the answer came pretty quick – not very long! This was a conundrum which brought into play the inevitable third sustainability consideration – economic. The farm had to make money to continue to exist; I had to have enough time and energy to complete or delegate all the tasks that needed to be done to make that money; and this had to be in a way that did as little damage to the Earth as possible, perhaps even nourishing the Earth in some ways. So with this new way of thinking I was developing there was a lot of shifting and a lot of contemplation about how to make this overall sustainability happen. And about how to find balance between all these system components (we’ll leave systems thinking for another blog). Over time I noticed I started thinking about a lot things the way I was thinking about sustainability – as a spectrum within which there needed to be balance. And one of the guiding principles behind the whole thing, which I was only recently to discover, was empathy – which is always concerned with the other side of the equation, whatever that equation may be. And thus, inevitably, it is concerned with balance. Farming is important. Growing food is important. Doing it in a way that does not harm the Earth is important and there are lots of tools and resources out there to help with that. Making money is important. Living a comfortable life is important. Experiencing life beyond farming is important. And this requires at least some money. Running a sustainable farm requires money. A farm that practices sustainable farming that does not make money is no longer able to practice sustainable farming. Balance is not something that always comes easily to me. And from my observations and experience, it does not appear to come easily to a lot of people. But as someone who values self-improvement I try to find ways to introduce balance into my life. This helps me manage my personal life in a more sustainable way. So why can’t it help me manage my understanding of sustainability as well? So, I don’t know if I needed to do all that rambling to get to this point, but in many ways I did. The framework I am proposing here (or, rather, developing here) is helping guide my work as both a Master’s student at UBC and Seed Security Program Manager at FarmFolk CityFolk. This framework did not arise from a literature review, or a textbook, or from survey results, but rather from my lived experience as an agriculturalist (which, ahem, includes textbooks, literature reviews, and survey results). As my research at UBC is very much based in ethnographic work, the lived experience of the community I am studying, it is important to draw on my own lived experience to help guide that process. I understand the academic rigour it may be subject to, but in doing so I need to acknowledge its personal roots (and, of course, will need to validate this through the academic literature). My basic take on spectrum thinking is to understand issues of sustainability on a sliding or balanced scale rather than from a black and white perspective. I come at this approach from a place of empathy and by accepting that the reasons we do things are complex and dynamic and that people are capable of change. I therefore shy away from judging a farmer for using chemicals, for example, as doing something bad and instead try to keep in mind all the historical, economic, and personal factors that may have lead a farmers to making their farming choices. For it could be argued that they had no choice at all but to accept a certain type of farming practice. Before we proceed, I now need to acknowledge the value set I bring to this discussion: that agricultural activities (in fact, all human activities) need to first and foremost take into consideration the impact they have on humans, in whatever form that may take (including recognizing that ecological impacts ultimately have human impacts) while still recognizing the economic reality of farming (and many other human activities) and the demands that brings. But it is important to acknowledge that economic interests, which are often considered by the few, can not come at the expense of human interests, which is usually considered by the many. In other words, the need to generate revenue and profit cannot come at the expense of human physical, mental, or emotional health. So from a spectrum perspective, say between human health needs and profit needs, it is important to understand that if we move too far towards one and away from the other, the integrity of the system can be compromised. For example, setting low wages for workers, not offering any benefits, and providing unsafe working conditions to reduce costs may create a profitable farm, but have major adverse effect on the health of the workers. Further, this approach can, in the long run, have negative economic impacts as well due to high worker turnover and training costs, increased health care costs, increased legal costs, and long-term instability to a farm that cannot maintain a strong workforce. At the same time, in efforts to be equitable and respectful to employees a farm may offer high wages, a great benefit package, and detailed Standard Operating Procedures to ensure worker safety. But if the farm cannot generate enough revenue to support these activities, then it is likely to experience financial hardship and risk folding. This puts everyone on the farm out of work and doesn’t give the farm the chance to make a positive human impact. Further, a farm needs to recognize that a high level of human consideration in its operations can be achieved over time, so one doesn’t need to start their farming operations by offering the highest wages and best benefit packages possible. Instead, it should start with a respectable work environment and work to improve the human benefits over time as it realizes financial success. So in this very simplified case we are looking for a balance that allows a farm or other operation to optimize revenue generation while at the same time optimizing the positive human impact of the farm’s activities. We are looking for balance. We take into consideration that when there appears to be competing needs or goals, we find balance in those needs to ensure one does little to compromise the other. I call this the balance the spectrum. When we take this perspective we can apply it to many different situations within a farm or within our lives. This is demonstrated in the first three spectra in the diagram which follows. 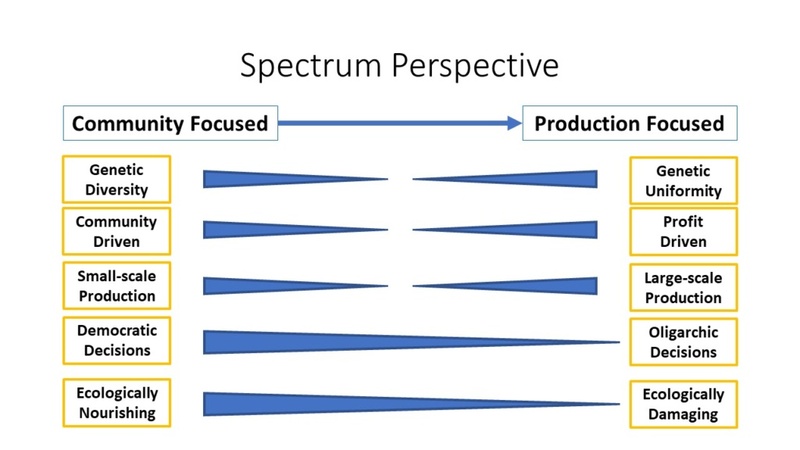 Another way of looking at the spectrum is on an increasing-decreasing spectrum in which the goal is to work more and more towards one end of the spectrum and away from the other. This is done in the belief that one end of the spectrum offers a wide range of benefits while the other end offers a narrow range benefits. This is the point with which I started thinking about the spectrum perspective using the broad concept of sustainability. Using spectrum language, I have long talked about increasing or decreasing sustainability and constantly acknowledging that sustainability is something to be achieved, and not a starting point for agriculture (though, like my previous example around human health, sustainability should still start at a reasonable baseline. If you remember graphing and calculus, just think y=mx+b!). This approach to sustainability as something to be achieved came from watching many young farmers trying to start their farms and try to apply all the sustainability principles they had learned as quickly as they could. I may have been guilty of this myself. But knowing principles theoretically and applying them practically can be worlds apart. And it is through our experience over time that we are better able to apply those principles successfully. Trying to do so too early in the development of a farming operation, or too quickly in a transition of practices in a farming operation, creates an increased amount of work in a field which is already labour intensive. So as you start down the path of sustainable farming, using organic principles is a great start, and perhaps it is better to integrate no-till soil management, swale water catchment design, and advanced intercropping into you farming system over time and not all in season one. Through empathy we can better understand the actions of others and acknowledge that actions which we perceive as detrimental to human health can be changed over time. When we compare practices on the more sustainable end of the spectrum with those on the less sustainable end of the spectrum it is through empathy we can understand that we are looking at those actions at a particular moment in time. And over time those practices have already made many shifts. We acknowledge the less ecologically damaging farming activities at one operation relative to the more ecologically damaging farming activities at another operation and may use this as opportunity to criticize the more ecologically damaging farm. But if each of those farms is in the process of shifting to the other end of the spectrum, which one receives the criticism then? But one can only write so much about empathy. It is not a difficult concept and explaining it at length does not easily elucidate the depth to which it can positively impact humanity. Empathy must be experienced to fully understand it. So recognize it the next time you are forgiven and remember it the next time you are caught up in judgment. I have a particular interest in participatory research which I currently define (at this particular moment in time) as a partnership between researchers and farmers which values local knowledge in developing and carrying out research projects to meet farmers’ needs by generating outcomes which contribute to farmers’ success. It is currently through participatory research (and, well, parenting) where I am most fully exploring the topic of empathy and will share musings on this in my next blog post. As I explored and wrote this post my mind often went to a place which compared empathy with justice and the differences in those approaches to increasing sustainability in agriculture. Both certainly have a place, but I notice I tend to shy away from what I would call the justice perspective. I still have many thoughts on this and have yet to find the words, the experience, or the literature to help aid me in that particular exploration. So watch for this discussion in a future blog post!